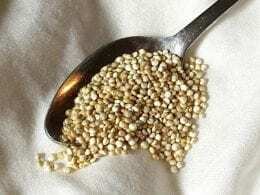 Could Quinoa be a Fountain of Youth? – You Asked It! Quinoa is known as a superfood because it is a complete protein and has positive effects on metabolism and energy balance. Now research from Rutgers University and North Carolina State University, has found that quinoa could slow down the aging process. The research study used a nematode worm, C. elegans, which has a short lifespan but age comparably to humans. They found improvements in lifespan, locomotor function, and mitochondrial bioenergetics. They found reductions in body fat and advanced glycation end products which worsen degenerative disease such as diabetes, kidney disease and Alzheimer’s disease. They also found lower reactive oxygen species, or oxygen radicals, which can damage DNA, RNA, and proteins leading to cell death. More research and clinical studies are needed to confirm these findings.